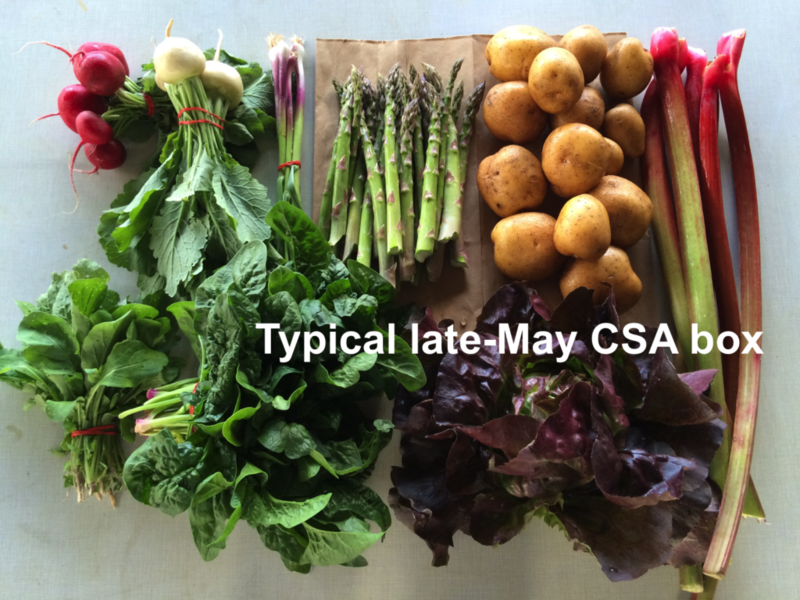 Our CSA deliveries begin this week for weekly members and for PURPLE every-other-week (EOW) members. GREEN EOW members, your first delivery is next week. We are thrilled the season has finally begun. It was a slow, cool start. We planned to begin deliveries on May 16, but pushed them to May 23 to let the crops grow. Our greenhouses were bursting with seedlings. Once the weather cleared, we hurried to get the plants in the ground. Carla transplants onions and realizes the transplanter has gotten too far ahead. Transplanting requires teamwork. One group rides the transplanter and lays out the seedlings, while another group plants them in the ground. The second group stays close to the transplanter in case there are problems. We upgraded to a newer, faster transplanter this year, which threw our pace off. We continue to experiment with reflective silver mulch to control insect problems in our onion crop. It’s an interesting no-spray approach to a problem we face each season. Tipi Facts: Things you need to know. ♦ Recipes will be on the Local Thyme website this year, instead of in our newsletter. ♦ The first few boxes of the season are always the lightest. Every-other-week (EOW) members, please do not worry that you have signed up for the wrong share. Later deliveries will be larger. ♦ We post our newsletter online each Wednesday night, then send a reminder email. ♦ EOW and weekly members, we assume that you read all the newsletters, even on your “off” weeks. We rely on the newsletter to communicate with everyone. You do not want to miss important information about the veggies, or a farm event announcement, or an opportunity to purchase extra tomatoes or peppers. Local Thyme menu service = New this year. We are excited about this change. We hired Pat Mulvey and Laura Gilliam of Local Thyme to prepare menus and recipes for our CSA this year. I’ve cooked extensively with their recipes and find them quick and delicious. We provide this service free-of-charge in 2013 to help you enjoy all your CSA produce, with less veggie waste. We hope you enjoy it. ♦ They will provide three menus: omnivore (ie, no dietary restrictions), vegetarian and gluten-free. Members can view all three menus. ♦ The menus will be customized to use every item in your box. ♦ Check out their weekly shopping lists, cooking tips and vegetable advice. Their searchable recipe archive is extensive. ♦ The menus and recipes will be housed on their website. You have to register on their website. Go to www.localthyme.net/register and enter the access code that I sent in my May 22 email. Pat and Laura work hard on their recipes, so access is restricted to Tipi members. Please don’t share the website with friends. ♦ Once registered, you’ll receive their Thursday afternoon announcement when the menus are ready. ♦ Their website will be available to us for one full year, so use it in winter too. ♦ A Tipi member with access to Local Thyme last year wrote “It was great for me. Menu planning is an additional task I usually don’t have time for. We end up wasting produce or using the same recipes that I feel are safe. It allowed me to show up at my pick-up site with a shopping list in hand of everything else I needed.” That sums up our hopes for the service. Coopers Tavern is hosting a fund-raising dinner for Partner Shares on June 3. See my previous post for details. Veggie Notes. Check this section each week for information about the veggies in the box. I’ll provide extra info on cooking and storage the first week that we send a vegetable. Does an item need extra washing? Does it have special qualities? This is the place to find out. For example, please, please refrigerate the potatoes. We explain the reason below. Asparagus – This is the most asparagus we’ve every sent in one delivery. Enjoy this spring treat! You will receive either green or purple asparagus. The purple variety will turn dark green when cooked, and the flavor is almost identical to normal green asparagus. The best way to wash asparagus is to submerge it in water, soak briefly, then swish vigorously and pull out of the water with the tips pointing down. The draining action helps pull the grit out of the asparagus tips. Repeat several times. Storage: Asparagus is perishable, so eat it as soon as possible. To store it, wrap the bundle in a paper towel and then store it loosely in a plastic bag. The asparagus tips tend to rot if in direct contact with the plastic bag. We snap our asparagus at harvest, rather than cutting it. Therefore, there is no need to snap the stalks to remove fibrous ends. For the same reason, it is not necessary to peel the asparagus stalks. It’s OK to trim the end a bit. Cooking: If your asparagus stalks vary greatly in size, you will want to cook the thicker ones longer. Put the asparagus in a steamer pot over water. Alternatively, you can lay spears flat in the bottom of a broad pan, with ½ inch of water. Cover and steam over medium heat until just tender. Use two forks or a spatula to turn the asparagus during cooking, rotating the bottom spears to the top. Drain and serve. Also excellent broiled or grilled. Good dressed with vinaigrette. We always eat our first asparagus dressed with lime juice, salt and pepper. Rhubarb – Refrigerate in a plastic bag. FYI, 2 lb of rhubarb will yield about 6 to 6.5 cups when chopped. Potatoes – You will receive white Superior potatoes or Gold Rush russets. Please refrigerate these potatoes. They are in great shape now but will sprout within days if stored at room temperature. They’ve been stored all winter and want to grow! Store in a paper bag to protect from light, even in the fridge. We grow everything we send in our CSA boxes except potatoes, garlic and mushrooms, which we buy from organic growers that we trust. We purchased these potatoes from Jesse Perkins at Vermont Valley Farm. Jesse says the potatoes have a higher sugar content because of starch to sugar conversion during cold storage. The potatoes taste a bit sweet, and will blacken slightly when fried. It’s a harmless color change due to the sugar conversion. Green garlic – (looks like scallions) – Steve planted 50% more green garlic than usual last fall. I wondered at the time if it was wise. Well, it was brilliant. This winter was hard on garlic. Every farmer I know lost a portion of their garlic planting over the winter, probably due to freezing and thawing cycles. I’m glad we have enough green garlic for everyone this week. That’s it until garlic scapes are ready to harvest. ♦ The cloves we planted last fall sprouted and grew into the stalks we’ve sent today. If left to grow, the slim white bulb on this week’s garlic would divide and form the usual cluster of cloves in a garlic bulb. Green garlic is more pungent than scallions, so slice thinly and use sparingly when raw. It mellows when cooked. Chop and add to any cooked dish that would benefit from garlic. Use the white bulbs and pale green stems. Avoid the dark green stems and leaves, as these are fibrous. Arugula – (small bunch of green leaves with pungent scent) – This is good mixed with lettuce or spinach in salads or in cooked dishes such as lasagne or quiche. I love it on sandwiches This batch of arugula has begun to bolt (stretch into a flower stalk) but remains tender and good eating quality. It is thin-leaved and will not store for long. Eat soon. Cover and refrigerate. Local Thyme will send an email on Thursday afternoon once the menus are ready to view.